Beach volleyball players and early successful legends of beach volleyball. Saenz won his first major tournament at the 1948 "Pacific Coast Outdoor Volleyball Championships" with Al Harris. Saenz went on to win 12 beach tournaments during a time when there were only one or two tournaments a year. Saenz is credited with creating a method to change sides during the game to even out the effects of sun and wind conditions. In the early days, teams changed sides only at 8 points. 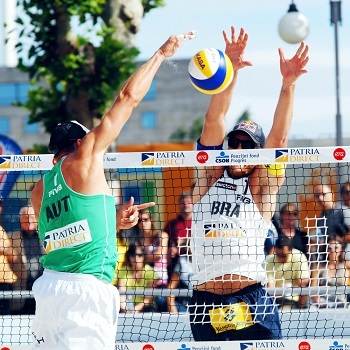 Saenz persuaded beach volleyball players to change sides when the total of each teams points was divisible by five. Bernie Holtzman first started playing beach volleyball at the age of 13. Holtzman is quoted as saying, "Volleyball is God's gift to the beach bum." Holtzman partnered with Saenz and won virtually every tournament they entered. Holtzman later teamed with Gene Selznick. Selznick and Holtzman were nearly unbeatable winning 18 championships together. One of the best players in the early years of beach volleyball, Selznick is credited with bringing the "spike" to the beach game. Although many players would spike the ball on the beach, Selznick would use the spike as a weapon. Along with success on the beach, Selznick would also pass his volleyball knowledge along as a highly successful coach. Selznick was also one of the best indoor volleyball players of his time. Selznick was inducted into the Volleyball Hall of Fame in 1988. Ron Lang partnered with Gene Selznick and then later with Ron Von Hagen to form two of the most successful beach partnerships of all time. Lang was also a member of the 1964 Olympic Team and a member of three national teams (1960, 1966, and 1968). Lee enjoyed his most success when he teamed up with Jim Menges. In 28 tournaments together, Menges and Lee won 25 while finishing 2nd in the other three. In 37 "Open" tournaments, Lee made the finals in all of them and won 29 tournament titles. Along with his success with Greg Lee, Menges won 8 titles with Matt Gage. O'Hara's career included a total of 20 championship victories. O'Hara was also a member of the 1964 Olympic Team along with being inducted into the Volleyball Hall of Fame in 1989. Von Hagen was one of the first beach volleyball players to include weight training in his workout program. Von Hagen was also one of the first players to train for beach volleyball year round. Von Hagen had more desire and was in better physical condition than most players. Von Hagen teamed up with Ron Lang to form one of the most successful beach partnerships in the history of beach volleyball. Von Hagen also won many tournaments from 1964 to 1977 with many different partners. One of the first women beach players, Latrielle teamed with Jean Brunicardi becoming one-half of the top women's teams in the 1950's and early 60's. Brunicardi was the first "beach queen" of beach volleyball. Brunicardi played unbelievable defense and had an incredible ability to read shots. Her stamina was unmatched by any opponent. In 1974, 42 year old Brunicardi won an "Open" tournament with 14 year old Nancy Cohen. At this time, the two were the oldest and youngest beach volleyball players to ever win an open women's doubles tournament. Gregory had an incredible 49 career victories. Gregory displayed dramatic behavior interacting with the beach crowd as well as her opponents. At 12 years old, Clancy starred in the sand playing mixed-doubles with Butch May. The two played together for 10 years. Matthies won with a variety of partners, but had the most success with Linda Hanley. Matthies and Hanley earned 30 tournament titles together. In the 1980's, Matthies had a major role in creating the Women's Professional Volleyball Association (WPVA). This organization dramatically enhanced the national visibility of the women's beach tour. Pepper is known for helping to establish women's volleyball in the United States. At a height of 6 foot, 1 inch, Peppler probably had the greatest physical talent of any women's player during her time. Ward was a force on the beach in the late 1950's and early 1960's. During the 1950's, Weir was one of the top women's beach volleyball players of her generation.